A small community near St. Petersburg has revealed a bust of President Vladimir Putin depicted as a Roman emperor – sans laurel crown. The man behind the monument is a controversial Cossack leader, who earlier advocated taking Alaska from the US. 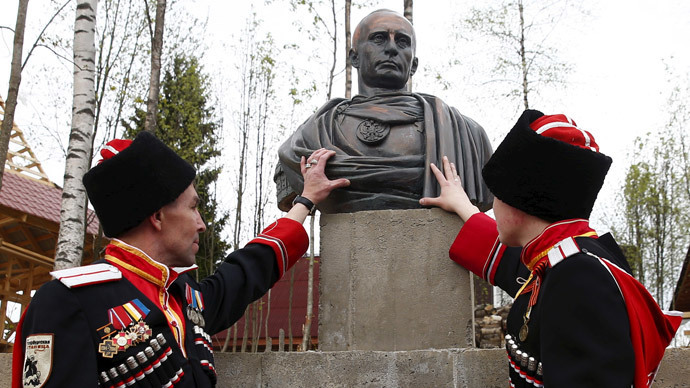 The bust of a patrician-style Putin was erected in a Cossack settlement near the village of Agalatovo, the Nevskye Novosty newspaper reported. It’s made of synthetic material mimicking bronze and has the president wearing a toga and a medallion adorned with the Russian crest. “There was this contest of statue projects, some had him wearing the Monomakh's Cap [the old relic of Russian tsars]. I tried those too and also had Putin ‘try on’ a suit of medieval armor. Why not?” sculptor Pavel Greshnikov, the author of the bust, told the newspaper. The laurel crown, a key feature in original Roman busts, was removed on the insistence of Andrey Polyakov, the Cossack leader who commissioned the statue. “He is Russian, and with a crown he would look too Roman,” he explained. The bust is a temporary feature, according to Polyakov, and will eventually be replaced with a permanent version twice the size and cast in real bronze. Polyakov is no stranger to publicity stunts. Last May, he suggested giving Russian citizenship to all descendants of Cossacks living in Alaska, saying it would help with an eventual return of the US state to Russian jurisdiction, reported Fontanka, one of St. Petersburg’s major newspapers. Putin’s image has had brushes with antiquity in the past, thanks to the efforts of overzealous activists. An exhibition in October last year depicted him as Heracles doing the twelve labors, although fighting corruption and building gas pipelines replaced slaying monsters and cleaning stables. His image has also been used on T-shirts, luxury smartphones, and in an upcoming political satire film. There was no immediate reaction from the Kremlin to the imperial bust. But judging from previous experience, Putin is likely to disapprove. In his public statements, he has said he dislikes attempts to name mountains or streets after him, or erect statues of him, saying such things are appropriate for dead statespersons, not living ones.